The Beaches Of Kerala - Which Are The Best? The tropical beaches of Kerala are among India's finest. With gently swaying palm trees, the seductively warm waters of the Arabian Sea, kites and eagles soaring above and dolphins swimming just off the shore, Kerala's beaches feel pretty close to paradise. Travelling through Kerala we have explored many of its beaches - remote stretches of sand to busy resorts, these pages cover the quiet beaches of Thalassery and undiscovered Kappad beach in the north. To the south, a visit to the travellers favourite, Varkala beach and world-famous Kovalam - this page gives an overview of Kerala's stunning coast. Kanwatheertha Beach One of the nothern most beaches of Kerala, this 4 km stretch of sand is just north of Manjeshwar in the Kasaragod district. A lake lies near the shoreline. Completely off the tourist trail, so expect solitude. There are few amenities for tourists and plenty of opportunity to soak up genuine local culture and hospitality. Kappil Beach Between Kasaragod town and Bekal Fort (see below), another near-deserted idyllic beach. As of yet almost untouched by the spread of tourism, it can not be long before this place is 'found' and hotels spring up. Bekal Beach and Fort Bekal's beach (also known as Pallikere beach) gives impressive views of Bekal Fort. A small entry fee applies to this beach, there is luxury tented accommodation which is very expensive at R.4000. Weekends and holidays can get very busy. Bekal Fort (R.5/100 Indian/Foreigner) was built between 1645 and 1660 from laterite stone (common to this region) and belonged to the Kadamba Dynasty and subsequently the Kolathiri Rajas, Vijayanagar Empire and the East India Company. For secluded backwaters, try the Bekal Boat Stay (www.bekalboatstay.com) 22km south of Bekal. This company offer cruises on the quiet Valiyaparamba backwaters. Payyambalam Beach 2km from Kannur town this beach has laterite cliffs that jut out into the sea. A landscaped garden and sculpture are by the beach, which can become crowded for sunset. Around Thalassery The area around the town of Thalassery in the Kannur district is one of the places we have particularly enjoyed whilst visiting beaches of Kerala. Muzhappilangad beach, Dharmadam island, historic Thalassery town... click here or on the picture for our advice, recommendations and ideas about travel in this area, and some more pictures! Vadakara Sandbanks 50kms from Kozhikode in the Kozhikode district, this beautiful stretch of coast is where the Kottakal river meets the sea. It is accessible by trains stopping at Vadakara (or by road). The beach is 5 minutes from here by bus. Payyoli Beach Ashore from the impressive Velliyamkallu rock (accessible by boat, home to seabirds), the shallow water of Payyoli beach make it a good beach for swimming. During November/December the beach becomes nesting ground for the endangered Olive Ridley turtles, so mercifully the beach is protected from any large scale development. 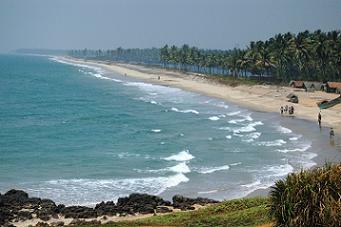 Vallikunnu Beach In the district of Malappuram, Vallikunnu is set amidst a coconut grove. Accommodation prices are quite high as the places to stay sit in the 'luxury' catergory. The Kadalundi Bird Sanctuary is nearby. Cherai Beach Ernakulam district. 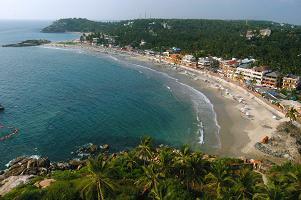 If you are staying in the historic, coastal town of Kochi it is well worth a visit to Cherai beach. It is situated on Vypeen island, which is easily accessible by boat. The long sandy beach is wonderful if you want to escape the city for a day, but excellent accommodation options are available here too. Fort Kochi Beach Not really suitable for swimming but worth a mention anyway, the beach on Kochi's island town of Fort Cochin must be one of the most atmospheric seafronts belonging to any town! Chinese fishing nets line the shore, market stalls line the promenade and freshly caught fish can be bought and cooked to order. 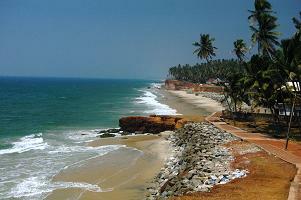 Varkala Beach One of the beaches of Kerala that is famous with tourists worldwide, Varkala should not be missed. Cafes and guesthouses nestle on the clifftop above the gentle curve of the bay below. Dolphins can often be seen off the coast, sandy beaches stretch off for miles either way, excellent food is served in restaurants overlooking the sea... Want to read more? Kovalam Beach Undeniably the most popular of Kerala's beaches for international tourists, this resort offers excellent food and amenities, a range of accommodation and plenty of activities. It is not just on but has a permanent investment on the tourist route. Click here for further information, and what we enjoyed about the place. If you are on the beaches of Kerala, please consider the local culture. While bikinis/swimsuits are normal on more developed beaches such as Varkala, Kovalam and Cherai, they are not so on quieter, undeveloped beaches, especially in northern Kerala. Wearing a t-shirt and shorts in the sea is a good way to avoid making anyone feel uncomfortable (including yourself). Bikinis in towns/villages are also likely to cause offence to some women and stares from most men, as well as giving some locals a negative impression of tourists. 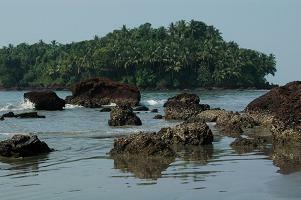 If you love holidays by the sea, have a look at the beaches in Goa page for more of India's beautiful west coast. 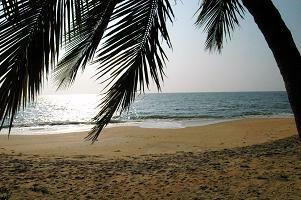 Add to our site and recommend a great beach in Kerala! Share photos and travel tips with our readers, and read other reviews! Kerala's luxurious houseboats transport visitors through miles of emerald green backwaters. Can you recommend a house boat cruise? Kerala's backwater regions are a world renowned travel destination with scenery that is breathtakingly beautiful. Explore Goa's stunning coastline with our comprehensive guide to Goa's beaches.